As a result of the neglect, Red has become more fearful, anxious and reactive to humans. How sad is that? 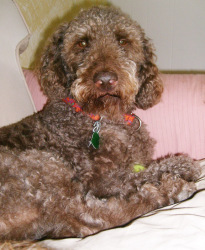 This handsome 3-year-old, 55-pound Labradoodle, needs someone who has time to work with him to get over his fears. Can you imagine getting welcomed into a family to only be crated and ignored the whole time? Learn more about Red on his Petfinder’s profile, and check out the full gallery of pets who are considered less adoptable. this just broke my heart. No doggie deserves to be treated like that. I am sharing him right now.